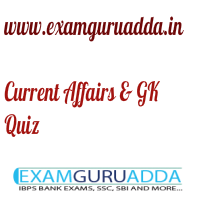 Dear Readers Examguruadda.in presents Current Affairs quiz of 23-24th December 2016 that cover important current affair events. Current Affairs quiz for IBPS PO,clerk, RRB-Po,Clerk, SBI, NIACL,Railways and SSC Exams. 1. Which country has successfully launched a solid fuel rocket named Epsilon-2? 2. The Union Water Resources Ministry has reconstituted a committee that was tasked with assisting the Krishna River Management Board (KRMB). Who headed the committee? 3. Which country has became the first country in the world to use drones for national mail service? 4. Who will receives the ‘Legends Award’ from the International Boxing Association (AIBA)? 5. Which Bank has launched EazyPay mobile application for merchants that allows all-in-one acceptance payments platform? 6. India’s largest lender State Bank of India has adopted a village in Maharashtra for cashless economy. What is the name of that village? 7. Who was chosen for the prestigious Jnanpith Award for the year 2016? 8. Performance on Health Outcomes index to rank States on the basis of their performance on measurable health indicators has been launched by whom? 9. The National Consumer Day is observed every year in India on which date? 10. Which State government has launched the Biju Sishu Surakshya Yojana, a scheme to nurture the orphan and HIV-infected children residing in different child care institutions and orphanages?